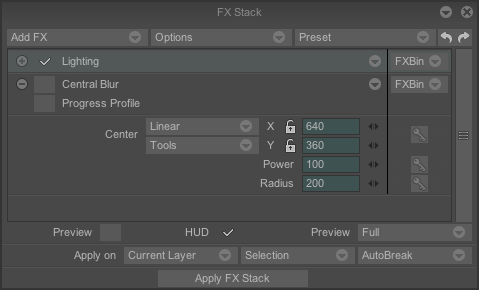 * One of the effects in your multiple FX stack is always selected. This effect is referred to as « current effect » (the one which seems to appear « brighter » while the other effects are « gray »). The keys visible in the timeline are always those of the current effect. * When several effects are used, it is possible to collapse them using the buttons top left. * The check boxes close to the arrows indicated above are used to enable or disable the effect they belong to. The Lighting effect is enabled and reduced. 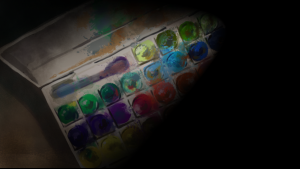 The Center blur effect is disabled and visible. The current effect is the Lighting effect. If the FX stack above is applied to our initial frame, we obtain the image shown opposite: Only the Lighting effect is taken into account. There is no Center Blur applied before it.